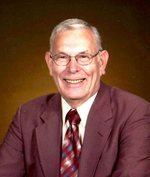 Bert Franklin Rial, 85, of Battle Creek, passed away Sunday, November 11, 2018. He was born October 1, 1933 in Fredonia Twp., MI the son of George and Blanche (Boyce) Rial. Bert served in the U.S. Air Force. He married Betty Johnson on January 1, 2007 in Battle Creek, MI. Bert retired from Waldorf Corp. after 20 plus years of service. He enjoyed golfing, fishing, traveling, and spending time with his friends and family. Bert was a member of Grace Fellowship Baptist Church in Sonoma, MI. He is survived by his wife, Betty Rial; children, Douglas (Bri) Rial, Denise (John) Calow, and David (Shauna) Rial; seven step-children; many grandchildren; a great granddaughter; three brothers; one sister; and many nieces, nephews, and cousins. He was preceded in death by his parents; first wife, Janette; one brother; and one sister. Visitation will be held at Bachman Hebble Funeral Service on Wednesday from 5:00-8:00 PM. Funeral services will be held Thursday at 11:00 AM at the Bachman Hebble Funeral Service. Entombment will be at the Memorial Park Cemetery in Battle Creek, MI. Memorial tributes may be made to Grace Fellowship Baptist Church Building Fund.